The problem is, this advice completely ignores that tired children want to sleep, and aren’t “being bad” or trying to drive their parents crazy. Instead, they’re actually struggling, and need help! So what’s a tired parent to do? There are lots of potential reasons a kid might not sleep well, and we can’t cover them all here. If your child is sleeping fewer than 4 hours a night, has neurological symptoms, or other serious health issues, please see a doctor. But if your child just fights bedtime or wakes more frequently than you’d prefer overnight…keep reading! In most cases, poor sleep habits are not for the reasons most say — lack of bed time routine, parents not being “firm” enough, bad habits when waking. A lot of “experts” blame parents for wakings, and suggest they just need to let their children cry it out, or punish them, or that allowing kids out of bed or to sleep with them “created” the problem. This is not true, though, in general. So why don’t kids sleep? Since magnesium has so many important uses in the body, this is usually the first thing to try! The best way to do it via magnesium chloride topically — in a spray or lotion. My favorite magnesium — GET IT HERE. Get out for a walk or some play time during the day! Do it during mid-day sun for 10 – 15 minutes if possible, because that also addresses #7! My favorite sources are dessicated beef liver pills (HERE) or herbal liquid (HERE). Yes, even kids can be stressed! Troubles at school, difficulties with siblings or parents, and much more can affect kids. Unfortunately, kids are experiencing stress, anxiety, and depression at younger and younger ages. A diet change and/or removal of the stressors is the best plan of action here. Talk to teachers or friends to figure out what’s up and address the issue(s). Remove sugar, food dyes, and processed foods. Adaptogenic herbs can also improve the body’s response to stress and promote more restful sleep. Lavender essential oil or clary sage essential oil may be beneficial here. Also, herbs like ashwagandha, catnip, or skullcap can improve the stress response and promote more restful sleep. Try my favorite herbal remedies HERE (any age) or HERE (older kids). This is a newer one, but zinc levels have been linked to sleep regulation. Higher consumption of zinc in the diet has been shown to improve sleep quality. If kids aren’t eating meat, nuts, or beans (and nuts/beans have to be properly soaked in order to get rid of the phytic acid so they don’t block zinc absorption), they can become deficient. Include more zinc-rich foods, especially meat. Dessicated liver pills are good (HERE). Diet changes, including avoiding sugar, refined white flour, synthetic B vitamins, and polyunsaturated oils are important here. Sometimes people want to treat sleep issues with things that are not a good idea…and are going to be more trouble than they’re worth in the long run. There are not a lot of long-term safety studies on it, and a lot of people who go on it, don’t get off of it. It can also cause day time sleepiness, stomach pain, and other side effects. While it may be useful in rare cases, these should be under the care of a medical professional. These are usually habit-forming, which is not a good thing for anyone — but especially children. They don’t address the underlying causes of sleep problems; they just force a child to sleep anyway. Not what you want! This is many peoples’ response to especially babies and toddlers who don’t sleep well. They’re told that it’s just willful, manipulative behavior, and that parents just need to be very firm with their children. Tactics include carrying children back to bed repeatedly, refusing to pick them up when they cry, locking their doors, and in general ignoring them. Some recommend spanking toddlers who get out of bed. 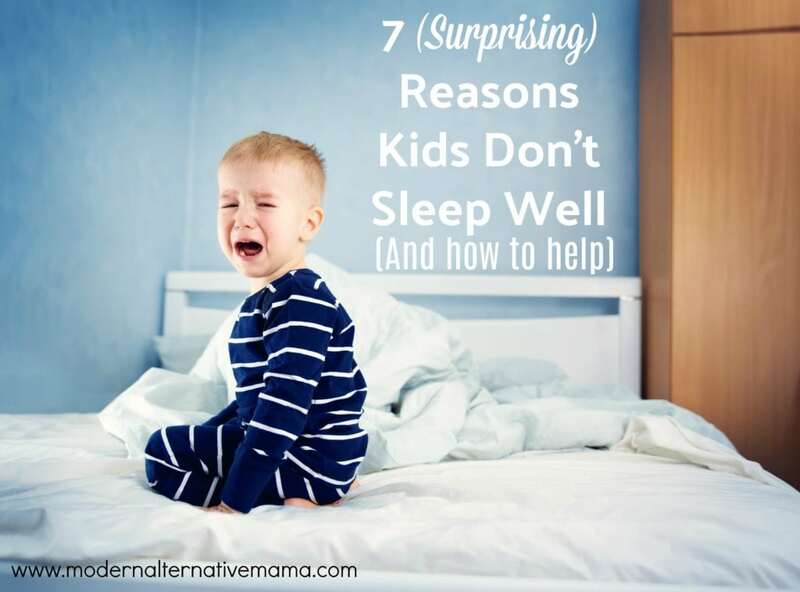 In general, if a child is having trouble sleeping, there’s a reason why. They are not just deciding not to sleep to annoy you. Punishing them or ignoring them does not solve the underlying problem or meet the need. Once the needs are met, a tired child will sleep! Please don’t ignore ongoing sleep issues. While everyone had a bad night here or there, weeks or months or poor sleep mean there’s something more going on. Since these vitamin and mineral deficiencies can affect a lot more than sleep (including brain development, immunity, and physical growth), it’s best not to ignore it, but to figure out what’s going on and help! Poor quality sleep has a negative and lasting impact on both the child and the parents. 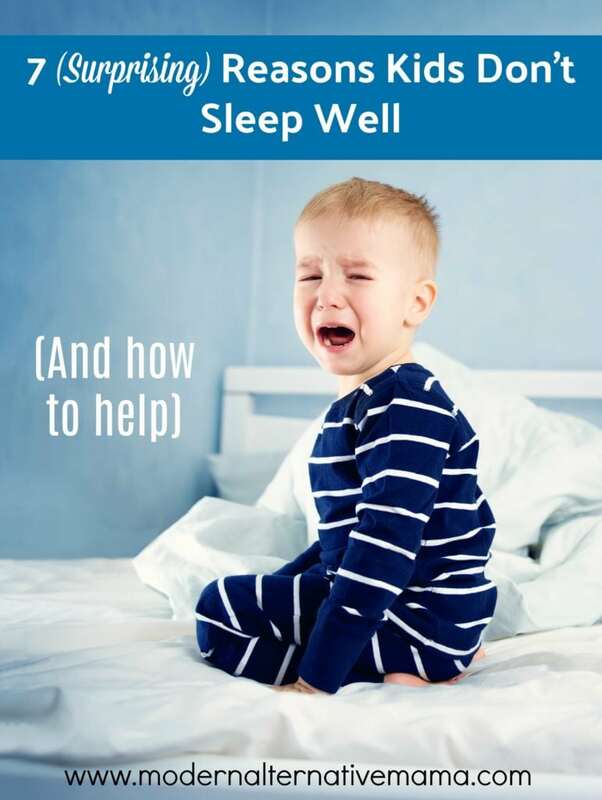 I hope this is helpful, for all you sleep-deprived families out there! How have you helped kids that don’t sleep well? Tongue ties can also affect sleep.